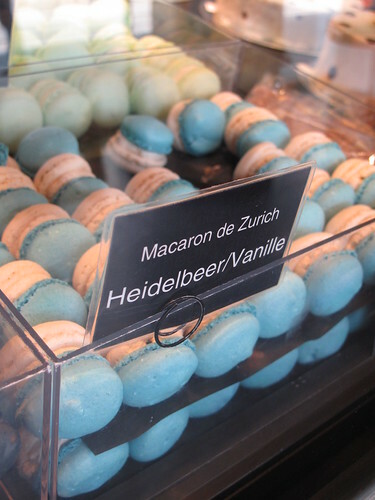 Even though I went to Vollenweider Confiseur Chocolatier the other day with one particular item in mind (the blue and white Macaron de Zürich below left), and actually went home with only that… you should know that the shop has a whole lot more to offer. 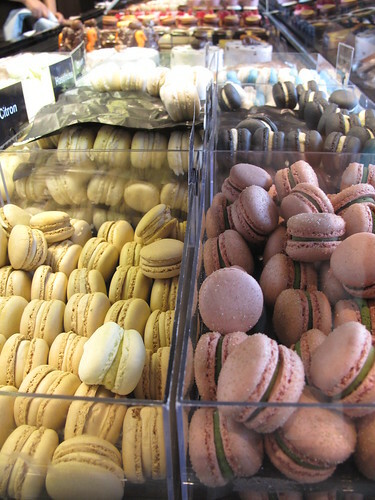 And I don’t mean simply more flavors of macarons either. 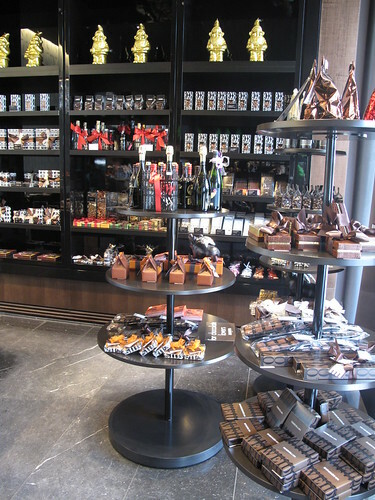 A very fancy chocolate shop in Zürich just behind the Opera House, it opened in October 2008 with its signature chic black and white design. 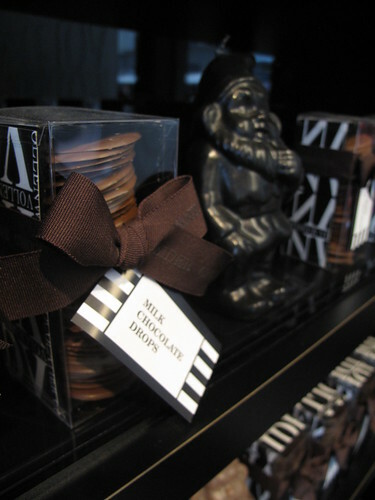 With beautiful displays in the windows and on the shelves, each product wrapped with a perfectly tied ribbon and handmade chocolates lined up just so, you know you’re dealing with expertise and experience here. In fact, Vollenweider has been around since 1943 in Winterthur, a town just 20 minutes from Zürich. Willi Georg Vollenweider’s son Hansueli now runs the show with his wife Marianne, using original recipes and family traditions, but innovating all the time. Everything done by hand, unusual flavors in chocolate and macarons, superior quality and utmost freshness in all ingredients used. When I learned all this, I hopped on a train to check it out. 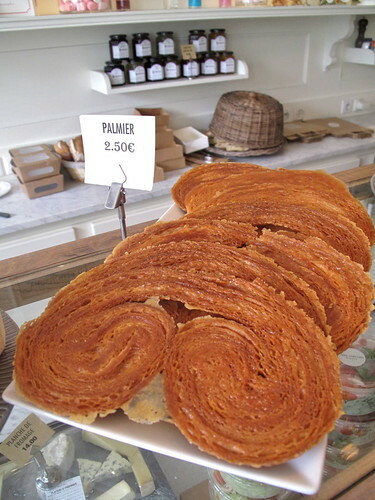 (And if baking maestro Nick Malgieri tells you it’s one of his favorite Swiss addresses, well you’d get on that train too!) 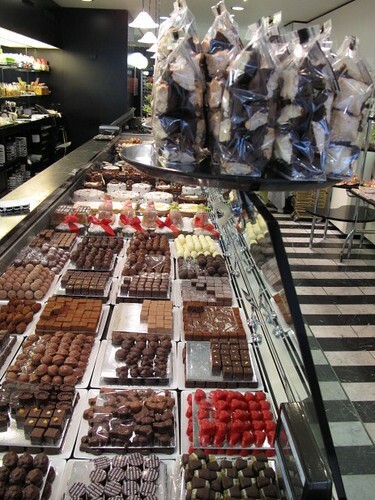 On Winterthurs’ main market street, there’s a chocolate and confection shop on one side, and a tea salon on the other. There are a lot more products than here in Zürich, plus a sit down café, yet the same chocolates, macarons and famous “giraffe cake” too. 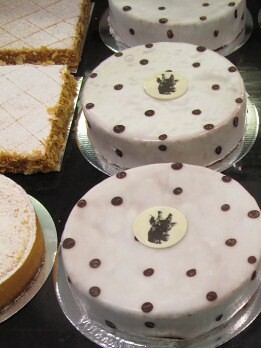 You might have guessed that it’s the white cake above with the black polka dots! 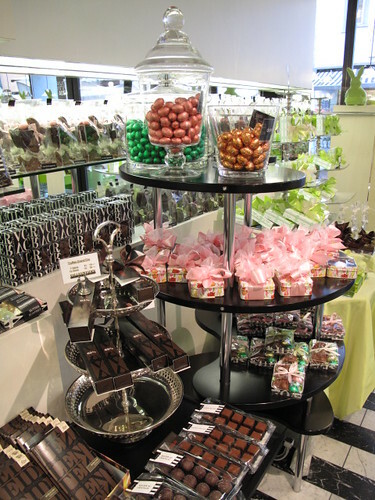 I went to Winterthur during Easter time, so I got to see all of Vollenweider’s impressive chocolate bunnies and other festive confections. The giraffe cake even came with a bunny on it too. I couldn’t help but notice their Gugelhopf besides it – of course (that’s kugelhopf in German). So I tried that too. Officially a “Mandelgugelhopf,” it had a distinct flavor of almond as the name suggests (Mandel), and hints of citrus too. Not your traditional kugelhopf by all means. Simply another example of Vollenweider’s personal touch and his take on a classic. Nothing wrong with that. This is a truly elegant chocolate shop. I could see myself sitting there late afternoon with a cappucino and a piece of the polka dot cake. The photography of each piece of cake or chocolate are so real that you can almost taste it. I must make this one of my stops when I do come to visit in October! My list is getting very long…..
Oh, if I had only known than I would have hopped off the train on my way back to St. Gallen. Now I am so sad. I guess we will have to make a stop there on our way to Italy next time. First things first. CONGRATS on the 2nd place finish for the Tripbase best travel and food blog. Well deserving. Keep up the awesome work. As for this post, extraordinary pictures. And what a shop! Great find. But I think I’m with Sam. Man those macarons look good! Wow…, how did I get here? It’s so good to see my home town. 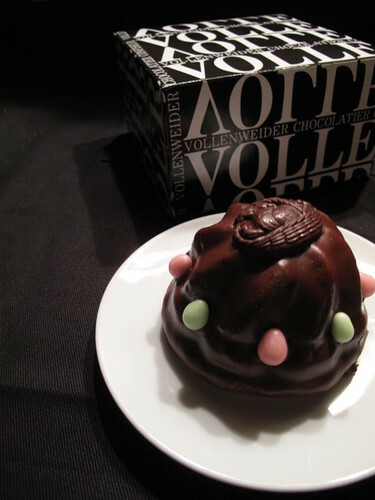 I just was in Zurich this May…, and did not know about Vollenweider! Did not know!! But did go to Spruengli of course. 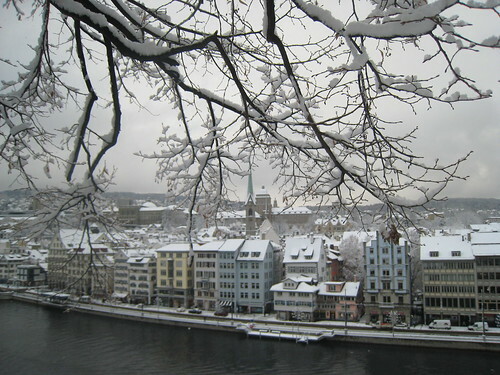 I lived in Zurich till 1996 (age 36) then relocated to the US (north east) to marry my husband (a New Yorker). Great blog, I’ll be back. Lani, perfect word you used – elegant chocolate/pastry indeed. And yes, definitely add this place to your list. In the next 3 months, it’s going to get even longer and longer… ! Sam, the macarons really are a highlight – just so cute looking, and as delicate, light and easy to pop in your mouth as they appear ! Kelleyn, don’t be sad. Now you have an excuse to visit Zürich again, haha! 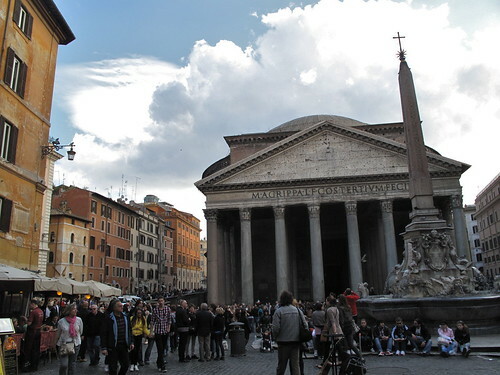 And oh la la, a trip to Italy planned, sounds wonderful ! Steve, excellent catch on the new Tripbase award banner above ! Thanks so much for the congrats wishes, I’m real excited about it for sure !! Maya, I don’t know how you got here either, but SO glad you did! 🙂 And wow, Zürich is your home town, how lucky you are ! You’ll have to tell me YOUR favorite Zürich addresses – that perhaps I don’t know about ! Meanwhile, I’m with your husband – originally from New York too ! Thanks for the great comment ! Next time I’m in Winterthur…. you know where to find me! 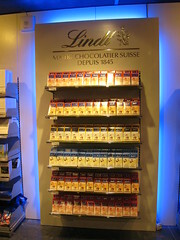 Until then the Zurich one will just have to tide me over. CONGRATS TO YOU ON YOUR NEWEST AWARD!!!!! Your awards continue to add to quite an impressive list…..congrats once again!!!!!! What a beautiful confiseur chocolatier! I even love that horizontal crystal chandelier (?) or whatever that is that is above the display, which is chock-full of goodies! Why can’t we have something like this in Toronto. I really only know of one store, Rahier, but even then, it’s not as spectacular as this one! Here in North America, it’s all about factory-made / volume business. Nobody focuses on the independent family business anymore. Sigh. Nowadays, I am about independent / family / small business initiatives – I wholeheartedly support them rather than those big-box corporations! P.S. I love the giraffe cake! So fancy and cute! You’ve convinced me: I have to go to Switzerland. Everything, both edible and inedible, looks fantastic! Lani, thanks so much for the enthusiastic congratulatory wishes !! Jen, thank you too !! 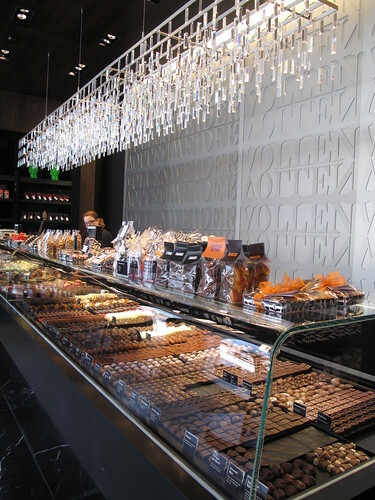 And yes, that chandelier is quite an object – especially for a chocolate shop! I’ll have a word with Herr Vollenweider and see what he thinks of opening a shop in Toronto ! 😉 I’m totally with you, factories with massive volume and $$$ as sole goal are unfortunate. I’m all about the independent family business with quality as priority, keeping to tradition. Mom and Pop kinda places. 3rd, 4th generation… forget the mega corporations. Nicole, YES – get thee to Switzerland! You’ll have more than plenty of material to rate for your chocolate site too ! Yet again I point out, Steve and Sam aside (and Sam my be a woman), that macarons are a “chick thing.” What is it with chicks and macarons? Congratulations on your award. Fantastic! How did that all happen? Love the pictures you have here. But was shaking my head at the thought of there being “more than macarons”. Was a bit unsure what you could possibly mean by that? Just kidding. Everything looks spectacular. How lucky are you? 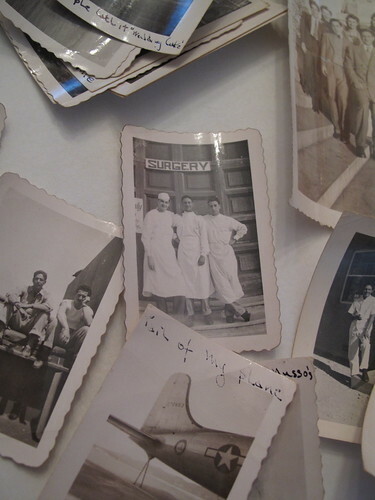 Oh, and us for you sharing these lovely pictures and story! FN, you will be pleased to know that, yes, Sam is in fact a woman! haha! Your argument has gotten stronger once again. Thank goodness for Steve on my end! 😉 I guess the thing with macarons is that they’re little, in beautiful colors, precious and delicate, sometimes on display like jewelry and fashionably wrapped up to go. 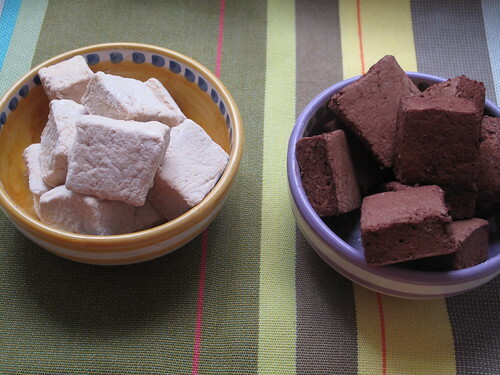 But then again, as Steve would argue here — they’re just delicious really, who cares about the rest !! Am I right? 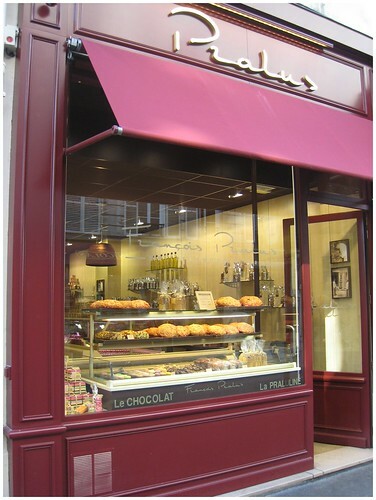 PS: Merci pour l’adresse du chocolatier Vollenweider, j’ai l’habitude d’acheter les Luxemburgerli (macarons) à la confiserie Lindt & Sprüngli quand je n’ai pas le temps de les faire moi-même, ceux à la vanille-myrtilles m’ont l’air délicieux. A dangerous dangerous store indeed. I would never have made it out alive. What award?! I must read on. And I will. right after I comment on this post. here’s my comment about this post: Sigh. Another great address, they should pay you for the great publicity you do to them (Excellent article and wonderful pictures), you should send them the link of your blog!!! I didn’t know for the new award so… congratulatiooooooooooooooons, you are the best!!!!!! 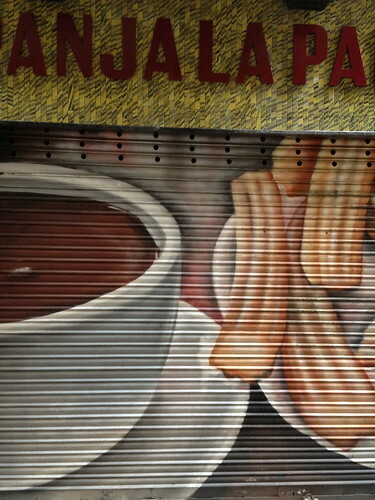 The pictures alone are making me hungry!! I would have gone over the top in that kind of shop! That’s one of the things I truly miss about Europe. Beautiful pictures!! Patricia, merci pour les commentaires super sympathiques! 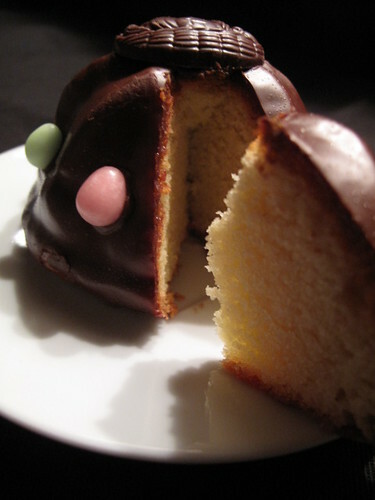 Je suis ravie que vous ayez decouvert MyKugelhopf – en cherchant quelle recette je me demande…?! La prochaine fois que vous allez achetez les Luxemburgerli chez Sprungli, faudra essayer les macarons chez Vollenweider, et me dire ce que vous en pensez ! Stéphanie, excellent idea. 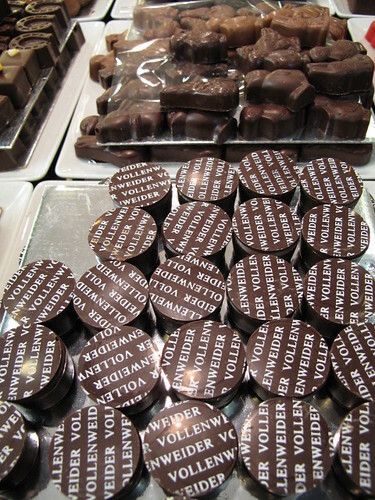 I’ll have to let the Vollenweider team know I am a fan, and see if they need any taste testers for new products! haha! Thanks also for the congrats!! 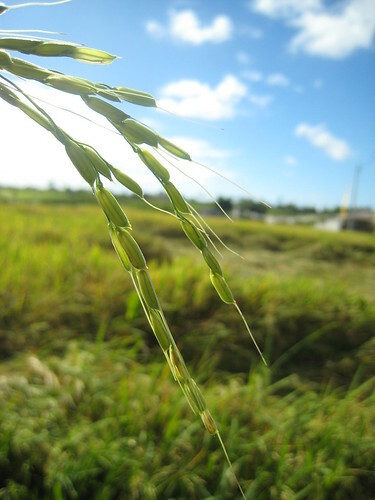 I am so glad to drop by and found this beautiful, useful and great blog. Is Mandelgugelhopf kind of like mandelbread/mandelbrot? Danielle, the only thing Mandelgugelhopf and Mandelbrot have in common are Mandel – almonds. 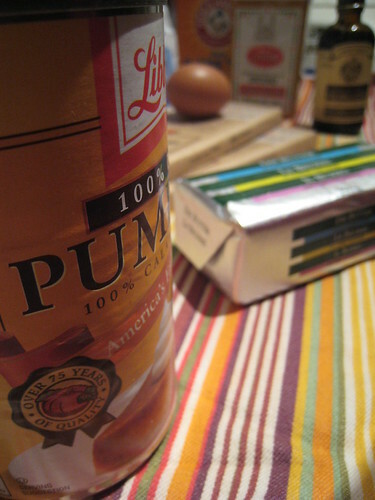 Otherwise, a traditional Gugelhopf is a yeast cake and not quite as dense as Vollenweider’s above. For its texture think brioche or challah, with raisins and nuts. 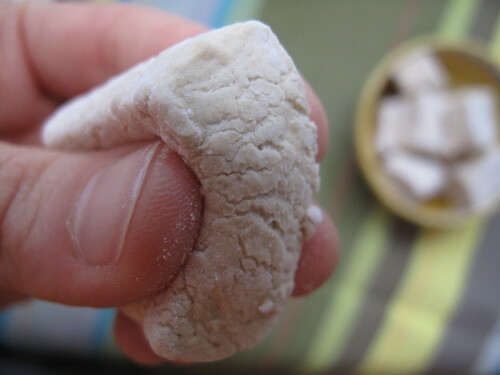 Mandelbrot as you know, could be compared to biscotti, dry and crunchy… and oh so good too! 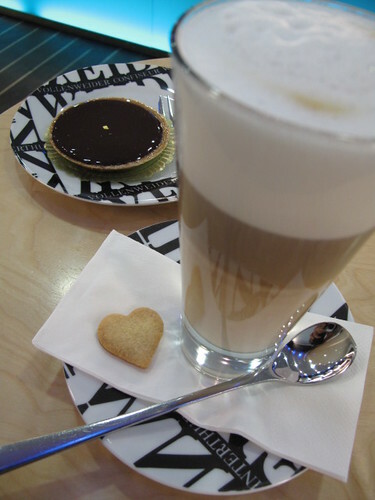 We added your nice report to the Vollenweider DokoDare Place Page.